The electric charcoal starter reviews can help with starting the charcoal for your barbecue, because this can be a little challenging sometimes. More and more people do not like to use the lighter fluid or starter blocks anymore because of the chemicals. A charcoal chimney starter is easy to use like you can read in our how to start a charcoal grill without lighter fluid, but some people do not like the use of them because of the newspaper that can blow away and they can get pretty hot. The next option we discuss here in our electric charcoal starter reviews is the use of an electric charcoal starter who are becoming more and more popular to use. We look at features like safety, Watts, Handle, Cord etc to provide you with all the information to choose the electric charcoal lighter that fits your needs. The looftlighter electric charcoal starter review shows that it is without doubt one of the most popular electric charcoal starters. 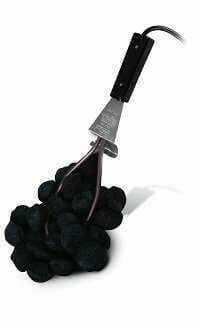 Some people even call it the best electric charcoal starter. This electric barbecue starter does not not use a flame, but a stream of hot air that according to the manufacturer reaches 1256 degrees Fahrenheit. There are over 170 ratings on Amazon with an average of 4.2 out of 5 stars. There was one user who described the looftlighter as a blow dryer on steroids and I think that is a good description. I just have seen a few problems with the durability of this electric charcoal starter, but they were most of the time causes by keeping it to close to the fire. 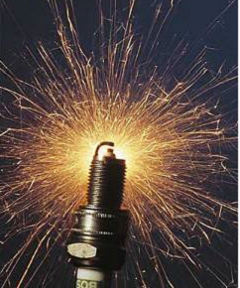 The looflighter is 1800 Watts in Europe and 1500 Watts in the USA. The difference is caused by the difference in voltage. The cost of using the looflighter is about 1//2 cent per minute. See if this is what you are looking for since the price is higher compared to some other products. 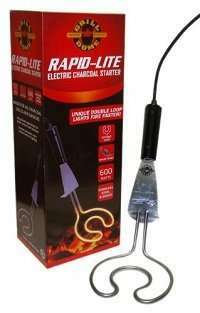 The grill dome rapid lite 600 watt electric charcoal lighter gets your grill started in about 8 minutes. The double loop that this design has increases the contact surface between the charcoal and the heating coil. The coil is made of stainless steel and this makes it last longer of course. Spread a layer of coal on the grill add the grill dome rapid lite electric barbecue starter after that add more charcoal on top of it. After about 8 minutes you can remove it and wait for the rest of the charcoal to start. The 12 inch handle should stay cool enough. 4.3 star rating from over 115 people is pretty good. 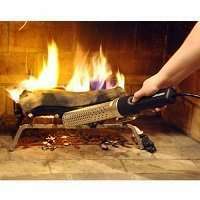 This electric charcoal starter is called the Char Broil SureFire electric charcoal starter. With its 600 Watts it is a little lighter than than the grill dome rapid lite. The heating coil is also form stainless steel but is just straight. The plastic handle will keep it cool to touch. The cord is a little short so you probably need a extension cord for this electric charcoal starter. 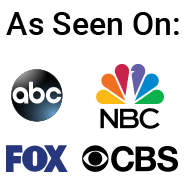 see our recommendation at the bottom of this page. Most of the over 140 ratings of this Char Broil electric starter we have read mention they are happy with the performance and they mentioned it works great even in windy circumstances. You definitely need a extension cord for this electric charcoal companion charcoal starter made by Char-Broil. The cord is to short to reach any outlet you have while in the grill. I could not find the Watts for it, but assume it is about the same as the other charcoal starters, around 600 Watts. The claim is this it will start your charcoal in about 10 minutes and I read that that is pretty much right on the dot and many even mentioned it takes only 8 minutes. With an average of 4.3 stars and covered by the Charcoal companion brand there is not much wrong with this electric charcoal starter. 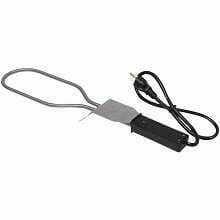 The Brinkmann electric charcoal starter is made of stainless steel and a heat resistant handle. The cord is 2 foot long, so we have to recommend again the use of a quality extension cord. Since the shape is not bend like some other brands you have to have it buried diagonal in the charcoal. This can be a problem if you only use a little charcoal maybe. For the rest this electric starter works as expected from a company like Brinkmann. The most used and safest way to start your charcoal with the help of any electric charcoal starter is to make sure that there is no technical problem with the charcoal lighter. Check the wiring and make sure these are okay. Also use a good quality extension cord if you have to. Now build a pile of charcoal big enough to stick your whole burner part in there. Make sure the handle is not straight above it but place the starter but in an angle, so it does not get burnt. The exception is the Looftlighter. This one works like a torch and need to be kept in you hand. Now all you have to do is plug it and wait till the charcoal starts to burn. After that remove your charcoal lighter and place it on a safe place where it can cool of. If you use this method there is not much that can go wrong. Just look at my recommendation about the best extension cord if you have to use one. 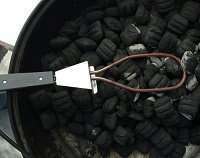 I personally use a chimney starter, because most of the time I use charcoal for my smoker. I can however imagine that if you live in a city or close to neighbors that an the change of pieces of burned paper flying around is not a great option. It can also be that your yard is next to a dry field in the summer and you do not like to use an open fire. In those situations an electric charcoal lighter is a better option. The biggest difference in my opinion is that with a chimney starter you light all the charcoal and with an electric grill starter you light only the charcoal that is touched by the heated tip and it will take longer for all the charcoal to be ready to use. It is up to you to decide what is the best electric grill starter I just hope you will use it in a safe way. Never exceed the time that is given in the manual. I think this is a safety features to prevent the handle and or cord from getting to hot and maybe melt. If you have to walk away and leave your electric grill lighter, make sure to use a timer. I read a story about a bad fire that got started with leaving an electric grill starter unattended. Best way of course is to stay with it at all times. Also make sure that you have a place to put the electric grill starter after using is as Charcoal lighter because it is still hot and needs to cool of in a safe spot to avoid a fire. The use of a quality extension cord is a must since most starters come with a real short cord that most of the time does not reach the outlet. 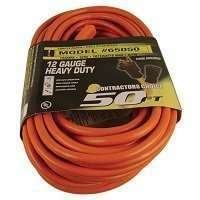 I found a high quality 12 gauge extension cord that came recommended form 260 people with a 4.8 star rating.